SUBHEAD: How bad is the Pacific Ocean from Fukushima radiation? What they did not tell you. 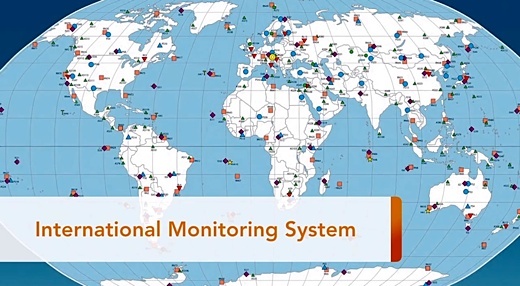 Image above: Still from profile by Ted Bowyer of the Pacific Northwest Laboratory showing international radiation monitoring stations of the Comprehensive Nuclear Test Ban Treaty Organization used by the Pacific Northwest Laboratory to determine impact of Fukushima radiation. . From (https://youtu.be/zON3mzhT9ao). 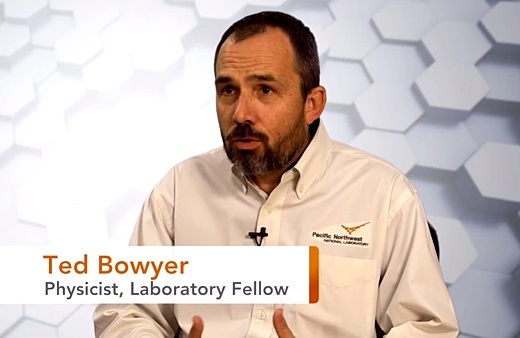 Image above: Still from Pacific Northwest Laboratory video showing Ted Bowyer making presentation. From (https://youtu.be/zON3mzhT9ao). SUBHEAD: A broad detailed review of documents from TEPCO and others indicating extent of releases of radioactive elements into environment. Video above: A 44 minute video detail studies on radiation in the Pacific Ocean related to Fukushima Nuclear Power Plant meltdowns. From (https://youtu.be/klgUBofqyok). 14~ Does the Fukushima NPP disaster affect the caesium activity of North Atlantic Ocean fish? 20~ Cesium, iodine and tritium in NW Pacific waters -- a comparison of the Fukushima impact with global fallout. Jiji Press, July 8, 2013: Tokyo Electric Power Co. says 2,300 becquerels per liter of tritium was found in seawater sampled off its crippled Fukushima No. 1 nuclear power station Wednesday, the highest level recorded since the March 2011 accident. [...] It is feared that groundwater containing high levels of tritium may be leaking into the sea from the plant's No. 2 reactor building. Officials report "troubling discovery" at Fukushima nuclear plant: Cesium levels rocket 9,000% over 3 days in groundwater — TEPCO "can't explain it"
original upload here: (thank you HatrickPenry) Good Job! SUBHEAD: The the multiple "unconnected" mass die-offs in the Pacific Ocean are troubling. Climate Change, Ocean Acidification, Garbage Gyres and Fukushima Radiation may all be contributing. Image above: Volunteers raced to save dozens of helpless dolphins stranded 4/10/15 on the shores of a city located 50 miles from Fukushima. 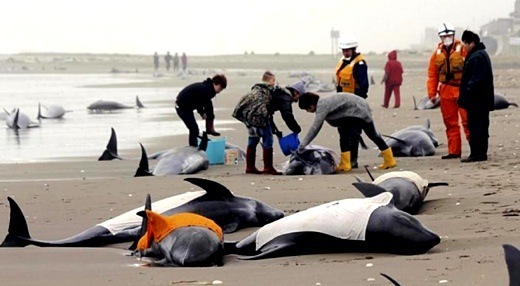 From (http://www.hngn.com/articles/83988/20150410/japan-150-dolphins-stranded-beach-north-tokyo.htm). KQED Science, Apr 5, 2015 (emphasis added): About thirty miles out from the Golden Gate, the federally protected Farallones are breeding grounds visited by hundreds of thousands of seabirds – many of which use the islands as a winter way station — but not this year. Gerry McChesney, manager of the site for the U.S. Fish and Wildlife Service, says that’s a bad sign not just for the Farallon Islands but also for wildlife more broadly along California’s coast. There was also hardship for breeding marine mammals. Dozens of pregnant sea lions proved too weak to carry their pups to term “That’s such a bizarre thing,” McChesney says. “We were seeing multiple aborted fetuses every day,” 94 in total – or nearly half the number of sea lions born there in 2014. Nor was the warm winter kind to elephant seal pups. Russ Bradley, Farallon program manager for Point Blue Conservation Science, says elephant seal mothers, trying to cool off amid the unusual heat, led their pups up to a cliff that, while breezy, proved perilous – “and actually had a fair amount of pups fall into this sea channel, because they’re pups and they’re clumsy and they got too close to the edge.” “It is pretty brutal for the biologists out here that had to watch it,” McChesney says. “It was pretty tough.” Among the conspicuously absent birds was a type called Cassin’s Auklet, which feeds on krill. All along the Pacific coast, McChesney says, these birds have been suffering “a huge, unprecedented die-off like we’ve never seen” for want of food. That’s also bad news for other species that eat krill, he says, from salmon to blue whales. US Fish & Wildlife Service, Apr 1, 2015: Over the past four months, seals and sea lions are having difficulty reproducing, local seabirds have had low colony attendance… Observations of disrupted breeding activities include: California sea lions aborting pups due to poor body condition of the mothers.